NASA's Max Launch Abort System is prepped for a scheduled June 20 test. This alternate system for Constellation would use four rocket motors to boost Orion astronauts clear of a launch pad disaster. Abullet-shaped escape ship could show how astronauts might avoid a launchdisaster during a planned launch test. And that's just the alternate escapesystem for NASA's Constellation astronauts headed back to the moon. TheMax LaunchAbort System (MLAS) is slated to blast off to an altitude of about one mileup, as part of an escape system test scheduled for June 20 at NASA's WallopsFlight Facility in Virginia. The test was delayed from a June 15 launch targetto allow extra rocket checks, NASA officials said. Theflight test includes the MLAS escape vehicle, as well as a full-scale mockup ofthe Orion capsule, NASA?s space shuttle replacement, tucked inside. If all goeswell, the crew capsule will eventually separate from the test vehicle andparachute down into the Atlantic Ocean — hopefully withoutproblems similar to those that plagued an earlier Orion parachutetest that crashed to Earth. TheMLAS design differs from the escape system for Orion and the ConstellationProgram, which uses a single rocket motor in a tower positioned above the Orioncrew capsule to help propel astronauts to safety. Arecent U.S. Air Force studies have questionedwhether Orion's current escape system can propel astronauts safely away from alaunch explosion. NASA has said that supercomputer analyses will show that thelaunch abort system can work. 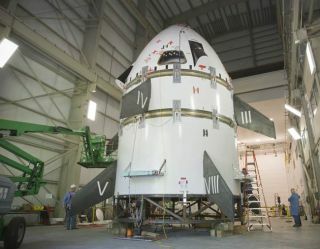 "MLASis a technology demonstrator not intended as a replacement for the Orion LAS[Launch Abort System]," said Keith Henry, a NASA spokesperson, in responseto a SPACE.com query. Instead,the project is slated to help the NASA Engineering and Safety Center gainexperience conducting flight tests. That independently-funded branch of theU.S. space agency is located at Langley Research Center in Virginia. MLASconsists of a flight test vehicle which weighs over 45,000 pounds and standsover 33 feet tall, resembling a white bullet with stubby fins. That vehicle isdesigned to house the Orion crew capsule which astronauts would ride in duringlaunch aboard an AresI rocket. Foursolid rocket motors would fire to boost the MLAS flight test vehicle away fromdanger during a theoretical launch pad emergency. For the upcoming flight test,the same rocket motors will launch the MLAS system from the ground, instead offrom the top of a larger rocket. Theestimated cost for MLAS comes to about $30 million, Henry noted. NASA'sMLAS Web site notes the possibility of "re-contact" between differentparts of the test vehicle after all parachutes have deployed, because MLAS hassupposedly not been calibrated for weight and parachute performance. The spaceagency does not expect any midair collisions during the planned launch toaffect either the test data or Orion's differently designed escape system. NASA?sConstellation program is developing the Orion spacecraft and Ares rockets toreplace the space shuttle fleet, which is set to retire in 2010. NASAplans to launch the first operational Orion flights in 2015, with a target ofreturning humans to the moon by 2020.